The load cell 355 is one of the absolute classic load cell designs. For more than 25 years, this highly reliable stainless steel load cell has remained unchanged and has been used in millions of industrial applications. Typical applications include platform scales, silo and hopper weighing, filling and bagging as well as being used for force and torque measurements in the test machines and Industrial Automation. Approved to OIML R60 for 4000D and sealed to IP68, guarantee extremely accurate reproducible results even at very high resolutions over a long term in harsh industrial environments. For multi-cell application such as a platform, the current matched version of the 355 removes the need for corner load adjustment using potentiometers. 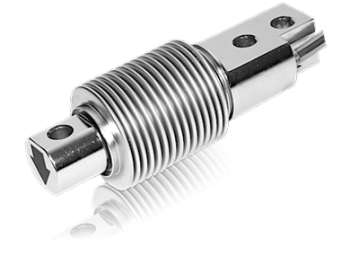 You can even replace a single load cell without a recalibration. The 355 bending beam load cell can be supplied with an optional ATEX II 1GD EEx ia IIC T6 certificate for use in hazardous gas and dust areas – Zone 0,1, 2 & Zone 20, 21, 22.